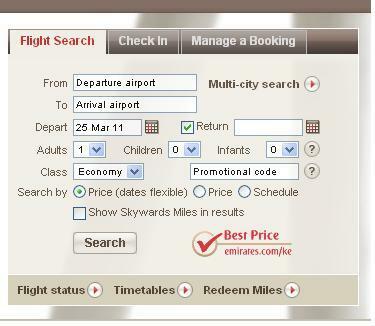 Emirates customers out of Nairobi can now book hotel and car hire reservations through Emirates’ website. The functionality is part of a multi-year technology partnership between Emirates and ezRez Software, Inc. that was announced in October 2010. In partnership with Tourico Holidays, Emirates now offers the convenience of booking hotels, car hires and airline tickets on one booking reference. Travellers can also use the new functionality to book hotel rooms and car hires (independently from an Emirates flight booking), or add hotels and car hires to their existing itinerary, via the Booking Manager. “Convenience is the key reason for our decision to provide land products — in addition to airline tickets — on our website. Travellers now have a one-stop shop for booking all of their core travel needs,” said Essa Sulaiman Ahmad, Emirates Airline Regional Manager for East Africa. The entire itinerary, whether booked individually or in a shopping cart with Emirates flights, is available through the “Manage a Booking” tab on the Emirates airline’s homepage. If no hotels or cars have been booked, the system will automatically offer personalized results, based on travel dates and destinations for the existing flight itinerary. Furthermore, hotel and car bookings can be conveniently modified or cancelled online. This same functionality will power Emirates’ popular Dubai Stopovers option, allowing travellers to choose their hotel online, rather than having to call a ticket office. If booked together with an Emirates flight, the price for all hotels in Dubai includes meet & assist at the airport and hotel transfers. “This is a unique product proposition that is only offered through Emirates’ Dubai Stopover program,” Mr. Ahmad said. All technology and online functionality is provided by ezRez Software. All products are pre-paid and customer service will be handled by Tourico Holidays. Land products cannot be booked in Angola, Brazil, Ghana, Iran, Ivory Coast, Nigeria, Sudan and Tanzania. Next articleWhat’s better when dealing with a multilingual website?